"We are willing to walk 100 miles for our students," said the Tulsa Classroom Teachers Association president. "What is the Oklahoma Legislature willing to do?" More than 100 educators embarked Wednesday on a 110-mile march from Tulsa, Oklahoma, to the state Capitol building on the third day of a statewide teachers' walkout. 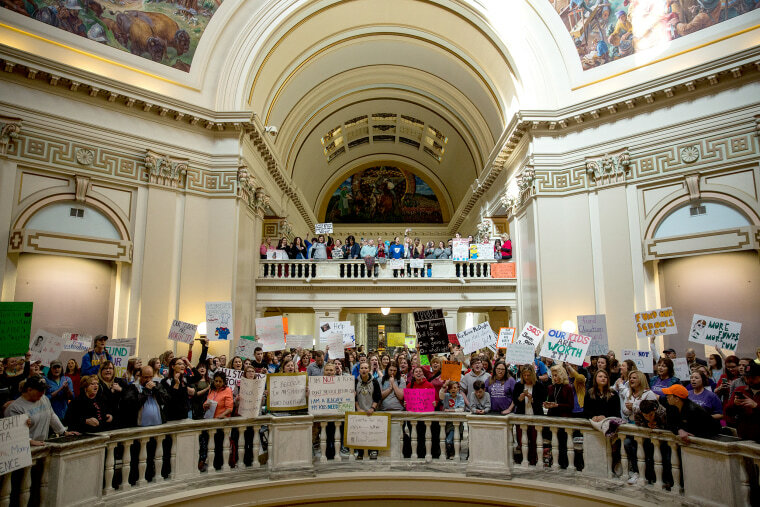 Across Oklahoma, thousands of teachers have staged walkouts since Monday to put pressure on lawmakers to increase funding for their classrooms, as well as raise teacher wages. On Wednesday, a group in Tulsa took their walkout on the road, gathering outside Webster High School at 8:30 a.m. to make the 110-mile trek to Oklahoma City, where they will join tens of thousands of other educators at the Capitol. Their trek, which will include rest stops, is anticipated to take seven days. Wednesday's leg, along Route 66, will take them to Kellyville High School, about 18 miles away. Deborah Gist, the superintendent of schools in Tulsa, said those walking have already received a lot of support. "It had me a little teary, actually," she told NBC affiliate KJRH in Tulsa. "Honking and waving, thumbs up, blowing kisses. Some would stop and offer assistance, people were bringing food. It was just really wonderful to see." "We're marching for the kids, for better school supplies, so teachers don't have to buy all of them out of pocket." "We do appreciate the raise. The main reasons that teachers are walking are because of the lack of funding for classrooms, the things that affect kids," said Brendan Jarvis, a seventh-grade geography teacher at Union public schools in Tulsa, who has been at the Capitol since Monday. "We're marching for the kids, for better school supplies, so teachers don't have to buy all of them out of pocket." The teachers are also seeking more money for themselves. Oklahoma ranks 47th out of the 50 states and the District of Columbia in public school revenue per student, and its average teacher salary of $45,276 ranked 49th before the latest raises, according to the National Education Association. More than 30,000 teachers and supporters camped outside the state Capitol in Oklahoma City on Monday, according to the Oklahoma Education Association. On Tuesday, about 1,000 teachers flocked inside the Capitol building, chanting, "We want our funding!" The Oklahoma teachers say they will continue their walkouts until legislators give them the increases they are seeking. More teachers are expected to join in along the 110-mile journey from Tulsa to Oklahoma City.